The 2018-2019 dance season is broken into 10, 4-week sessions. Dreamers are automatically re-enrolled into their classes every session unless the studio is otherwise notified by the parent. Written notification of discontinuing a class must be given prior to the start date of the next session in order to avoid being charged for the upcoming session. A parent must visit the front desk to complete a class withdrawal form in order for a dreamer to be removed from a class. There are no refunds for those who discontinue taking lessons at any time during the session. Auto Pay System – Tuition is paid via auto draft from a credit card (Visa, MasterCard, AMEX, Discover) or debit card. Upon registration, all families submit a credit card or debit card. Each session’s tuition will be automatically deducted on the Sunday prior to the start of the new session (see session dates below). At the time of registration, an annual enrollment fee of $25 per immediate family will be charged with tuition. An email receipt will be sent as confirmation of payment. All accounts past due after the new session begins will automatically be charged a $20 late fee. A $25 fee will be charged for all returned checks. 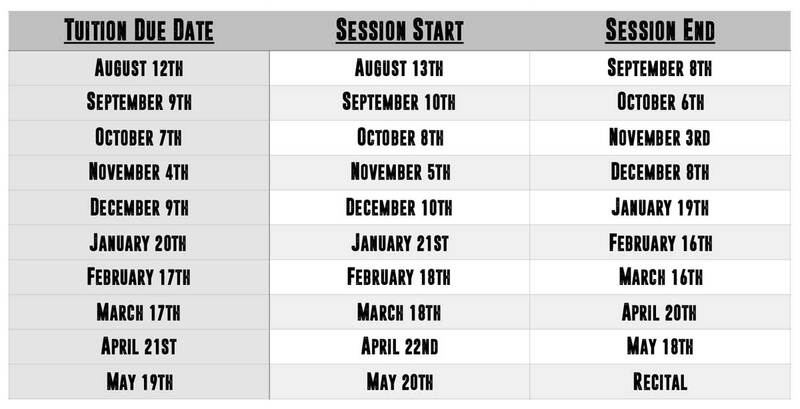 *Please Note: Session 10 is 3 calendar weeks. The dress rehearsal (June 11th) and recitals on June 12th & 13th, 2019 will serve as the last class of the session for all dancers. Class Makeup Policy – In the event of a missed class, dreamers are welcome to take any class that coordinates with their age, even if it is a different style. Missed classes must be made up within 4 weeks from the date of the absence. Snow Day Cancellations – If the studio closes due to extreme weather conditions, dreamers are welcome to take any class as a makeup class, provided it coordinates with their age level. Makeup classes may be in a different dance style.